In 2005 the Arts Council and Culture 10 ( a programme of ‘world-class’ events running from 2004 to 2010) wished to commission large-scale public events as part of an “International Festival of Rivers and the Sea.” EI was successful in proposing 3 events, including an entirely water-borne theatrical performance to take place on Keilder Water in rural Northumberland. Since Keilder Water is managed by Northumbrian Water they became the client for the event. 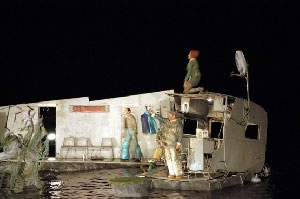 This was the UK premiere of a production originally staged in Munster, Germany to commemorate the floods which devastated that region in 2002. It is a performance of great originality and amazing transformation and water effects. However, staging the event posed a number of problems including: 1. the remoteness of the location; 2. sensitivity around a water company promoting a show about floods! 3. health and safety concerns, which in recent years had seen the reservoir (Keilder Water) greatly reduce its activities as a centre for water sports. EI was successful in addressing all of these issues and the shows were well-received by sell-out (paying) audiences totalling 3,200 people.